That is the kind of negative view of our area I wanted to counter with the Song For Adamsdown project. When I moved to Adamsdown in 1990 I could see the area had problems, the same problems as any inner city area afflicted by the totally unacceptable levels of poverty and inequality which still exist in our supposedly civilised society. But I could also see the area had immense charisma, was full of bustle and life, and boasted some of the most attractive buildings and vistas in Cardiff – not to mention a rich history, friendly people, big gardens and memorable street names. Nor is a dangerous place to be after dark, as long as you avoid what the occasional stray dog leaves behind. 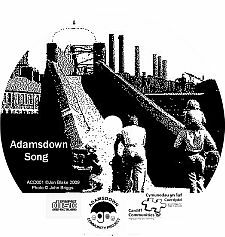 The Song for Adamsdown project was first proposed to the Adamsdown Community Project in December 2008. It was taken on as an Adamsdown Arts Association initiative and welcomed by the heads of local primary schools. 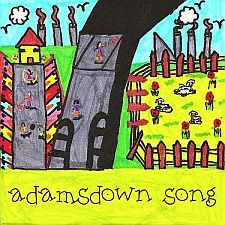 The idea was to write a song which encapsulated both Adamsdown’s history and the area today, to be sung by pupils in the local schools, who would also help to draft the lyrics and do the artwork for the CD. I wanted us to create something which would give all Adamsdown’s residents a good feeling about the place where we live, and in a small way help us to bond as a community – again, like many inner city areas, Adamsdown’s population is changing rapidly, and many people have no sense of belonging. But Adamsdown has many advantages which this project have thrown to light. Not the least is the new Atrium building, part of the University of Glamorgan, whose recording studios we have been able to use. Funding was provided from the Communities First initiative, channelled through the Adamsdown Community Project on Moira Terrace, another vital resource helping make Adamsdown a better place to live. Then there are the schools – I visit a lot of schools as a writer and can vouch for the fact that Adamsdown’s schools have some of the most dedicated teachers and welcoming, positive environments for learning I’ve come across. The contribution of pupils to the writing and performance of the song was fantastic. Hopefully this song project will only be the beginning and future projects will give a voice to many other people in the area. Spread the word! Lyrics to the song and notes about these are on a separate page.